Not The Barnet Times: Mind your language! 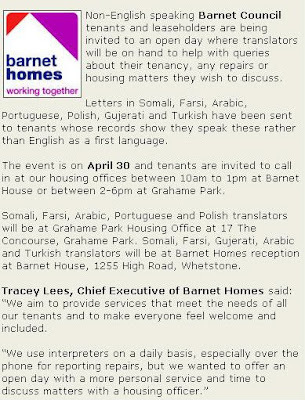 This week Barnet Homes is running an open day for non English speaking council tenants. This is a particularly delicate subject because obviously the council does not want to discriminate against any residents or be considered racist. On the whole, I think the council has got this policy right. I have no argument with that guiding principle, but is it being unreasonable to ask that people who are in receipt of a council property should learn to speak English? My paternal grandparents arrived in this country at the turn of the last century fleeing persecution. They were warmly welcomed into British society and, in common with most refugees at that time, they learnt to speak the language. The United Kingdom has a long and proud tradition of accepting genuine refugees to our shores and, needless to say, I am in full support of that policy. But it almost goes without saying that unless they can speak English, they will never be able to fully integrate into society. The danger is that if immigrants are perceived to be receiving special treatment, it can breed resentment amongst the indigenous population and gives an excuse to extremist groups like the BNP to whip up racial tension. If people are entitled to benefits, they should receive them. But rather than spending what must be a small fortune on providing interpreters and translation services, wouldn’t the money be better spent teaching immigrants English? a) We have a resposibility to look after those fleeing terror, some of whom won't speak English. I spoke to Iraqi taxi driver, who had to flee for helping the British in Basra. He told me he spoke no English on arrival. Won’t or can’t speak English? That’s the point I’m making. There are some people who arrive in this country who simply make no effort to integrate or learn the language. That is wrong, both for the immigrants (and their families) and the rest of the community. If I went to live in Iraq (and I am sure there would be a whip round in the Town Hall for me to go!) I would need to speak Arabic or I wouldn’t survive very long. The reason that English is the 2nd langauge of the world is because we never learn foreign languages. We are a Nation of lazy sods in this respect, so we really can't criticise anyone. Having recently moved to Israel, I am attending Ulpan (Hebrew language school) paid for by the Government. Could this be something that could be introduced in the UK for new immigrants. There may well be such schemes operating already. In the long term it must be cheaper to teach immigrants English than to provide interpreters/translators and I’m sure I’m not the first person to realise this!